Personal and professional development refers to improvement in the set of skills that requires gaining the desires position at workplace and maintaining the good relations with the people in social life. Personal development includes qualities like social competencies, behaviour, and understanding of people. Professional development involves communication, knowledge of operation in interested field, planning and proper management of time to achieve the goals and objectives (McNiff, 2010). The Unit 13 Personal and Professional Skills Development Assignment Copy will evaluate the approaches of self-managed learning that can be used for encouraging the learning of Travelodge hotel staff and propose the ways of lifelong learning in personal and professional context. Travelodge is private limited organization in hospitality industry that is operating business with 6000 (Full and part time) staff members to meet the objectives of business as well satisfied the needs of customers. Report will provide the information about my own current skills and competencies against professional standard of organization as an assistant manager and develop the plan for improvement in areas of lacking. In the next part report will discuss the processes and activities required to implement the plan and critically analyze the learning against the original aims and objectives. Moreover, report will provide the solutions for overcome the high turnover rate of staff members at Paramount travel hotel Park Royal as well analyze the communication styles and time management strategic. Observation: This is an effective self-managed learning approach for staff members to gain the knowledge and understanding about the practices and operations that performed at hotel (Moon, 2013). By having close observation of senior staff members the staff members could craft improvement in the set of skills like communication with customers, planning and utilization of resources which will help to encourage the effectiveness at workplace. Reading: For individual reading about the role and responsibilities is also good way to maintain the self managed learning. By reading the books, articles and journals about the operations of hotel and process to meet the benchmarking standard will help individual to craft improvement in the set of skill as well improve the professional understanding that will help to achieve the personal goals and objectives more convincing manners (Lago, 2010). This kind of approach will be cost and time effective. In order to craft improvement in the knowledge, skills and quality to sustain position at workplace, learning plays critical role. Being the manager at Travel, I will suggest the following ways for life-long learning that will help to increase the efficiency of staff members and support them to meet the personal and professional objectives. Self-evaluation: For life-long learning, self-evaluation would be more effective to understand the own value against the benchmarking standard of Travelodge. I will suggest my team to properly evaluate the own skills and gaps that are influencing the performance and working. Moreover, I will implement the policies and corrective measures for better understanding of effectiveness of individual at workplace (Bunderson and Boumgarden, 2010). For example, collect the own refection of staff member about performance that will help them to know area of lacking and make efforts to improve. Apart from that, this kind of approach will also beneficial for me to maintain the learning through evaluation of own against the standard. Internet: In the current scenario, internet is offering all kind of information and tools that could be used for life-long learning. For that staff members of Travelodge use of online source would be beneficial to gain the knowledge about the resource and their utilization in best manner to achieve the goals and make positive impression on top management. For me it will be key resource for identifying the trends and new policies to lead the people and motivate them to manage the operations at hotel in efficient manners (Graves, 2013). Online learning is key part for both personal and professional context that help to put innovation and increase the level of creativity in working and interacting with people at workplace. Improvement in skills: For me self-managed learning is beneficial for encouraging the skills like communication, planning of resources, allocation of role and responsibility and decision making to contribute in the development of organization. By using the self-managed learning approaches I have crafted improvement in the leadership and time managed management qualities which are major areas of lacking in professional context. Get the higher position: By using the self-managed learning, I would able to get the higher position in organization (Bradbury.et.al. 2012). Through self-managed learning, I have gained the knowledge about the leading, decision making and planning of operations that helping me to achieve the goals and objectives as well get the reorganization of top management which will aid to get the promotion. Service standard: Self-managed learning of staff would be beneficial for Travelodge to craft improvement in the quality of services as well in efficiency (Zepeda, 2011). By using the self-managed learning the productivity and knowledge of staff members would be increased that will help to achieve the organizational goals and improve the facilities to attract more customers. Customer satisfaction: Learning of staff members and manager will aid organization to improve the effectiveness of services like accommodation, housekeeping, delivery of products and communication. This will increase the customer satisfaction level and support to retain them as well influence the decision of target customers (Aspin and Chapman, 2012). Hence, self-managed learning is beneficial for organization too. According to given scenario, I am working as assistant manager at Travelodge and looking to gain the higher position at workplace. For that reason, I have to evaluate the current set of skills and competencies to identify the areas of lacking and strength for further improvement which will support to achieve the desired goals. Through self-evaluation I have analyzed the skills against the professional standard of manager and objectives of Travelodge. From the evaluation it is being carried out that command over different language, time management, decision making and planning of operations are the major areas that requires the improvement to gain the higher position and meet the organizational objectives (De Freitas.et.al. 2010). Moreover, knowledge about the global approaches and changes in the environment of hospitality functions are key areas to concern which also requires improvement. In addition to this, through self-evaluation I have come to know that skill of motivating staff and utilization of resources is not up to the standard of manager as well the proper management of time according to day operation and consideration of effectiveness of staff members at Travelodge. Being the assistant manager at Travelodge I have to craft improvement in the set of skills that identified using the self-evaluation and SWOT analysis. In order to overcome the gap according to standard of organization and manager at hotel I will follow the different activities like use of online sources, reading and take part in seminaries and conferences. According to analysis there are need of improvement in time management, decision making, planning, command over different language and knowledge of international standards of working in hospitality organization (Desimone, 2011). For that I will take suggestions from the mentors and leading staff member of organization that will also help to choose the activities that are effective as per my ability to learn. Moreover, to craft improvement in the skills that identified using the analysis I will observe the people around me who are handling the operations at Travelodge and providing the guideline for executing the plan of hotel. Apart from that to meet the development needs I will watch the videos and listen audios to gain the knowledge about the time management, planning of resources at hotel and remain calm in critical situations (Wenger, 2011). This kind of approach and activities will help me to meet the development needs and maintain the growth according to plan as well sustain the position. By reviewing the past activities and take the suggestion from leading staff (Murdoch?Eaton and Whittle, 2012). Use of past activities and collection of review of other team members for decision making (Nicholls, 2014). Make interaction with international visitor using the gesture and different language. Taking part in meeting at hotel and parties with staff members. For development in personal and professional skills, I have established the plan. Now to implement the plan I will use the following activities to utilize it properly. Mentoring: This would be the important process for implementing the plan and meet the organizational and personal objectives. By using this, process I will take assistance of experts from different fields to execute the activities as per the plan. This kind of process will help to gain the knowledge about proper time allocation, advice for using the resources and tools that would be beneficial for crafting improvement (Pedler, 2011). Training: For implementation of plan training will also an effective process that will help to perform the tasks as per the plan and provide the direction for making changes according to new trends. Moreover, training would help to work hard and manage the activities according to level of learning and stay energetic (Robbins.et.al. 2013). By using the training process I will focus on the communication, leading, planning and team working. For example, in training I will work on the skills with proper monitoring that will improve the effectiveness of plan. By following the personal and professional development plan, I have crafted improvement in the different skills and competencies like communication, planning and leadership but still there are some qualities needed more efforts to meet the desired objectives. For analyzing the effectiveness of plan and learning I have collected the feedback from mentors and trainers that helped to understand the areas of improvement and lacking. By considering their feedback, I have come to know that improvement in language learning, utilization and arrangement of resources and leadership requires the more efforts to achieve the desired level for future needs (Schein, 2010). For further improvement, I will use the online sources and take the experts advices that will help to meet the objectives in both personal and professional context to maintain the effectiveness as well gain the position of manager at Travelodge. Join the training centers and try to communicate with people (Scott.et.al 2010). Rewards and incentives: In order to engage the staff and meet the satisfaction level the organization could offer rewards and incentives to staff of hotel. For example, Paramount hotel would provide rewards to staff member who are performing well which will boost the morale and keep the other staff members motivated to stay in organization (Sitzmann.et.al. 2010). Policy of incentive will overcome the situation of high turnover and helps to maintain the operational flow. Email: This would be cost and time effective communication style that could be used by the manager at Paramount hotel. Email communication will help to maintain the two way communication process as the employees of organization can provide their input for changes and offer new ideas for managing the operations (Thrun and Pratt, 2012). Meetings: This is traditional method of communicating the information to respective staff members and collecting the real time feedback to analyze the response of individual. For example, line manager of Paramount hotel is conducting the meetings to explain the tasks and role to team members as well anticipate the needs of individual that helps to develop further plan. Prioritization: This is an effective strategy that can be used for doing the first thing first and plan the activities more convincing manners. The line manager of organization would define the role and responsibilities of individual according to skills and expertise (Stenfors-Hayes.et.al. 2010). The prioritization of task would be done according to needs of customer and events at Paramount hotel that will save time and helps to meet the deadline. Scheduling: The manager of hotel should plan the human resources according to operational activities and needs of customer. Scheduling of task will support to overcome the time for arranging resources as well allocation. Moreover, proper scheduling of tasks and operations at workplace will helps to assign role and responsibilities to staff and support to maintain the positive working environment where staff members perform the functions as per the capabilities (Stüber, 2011). 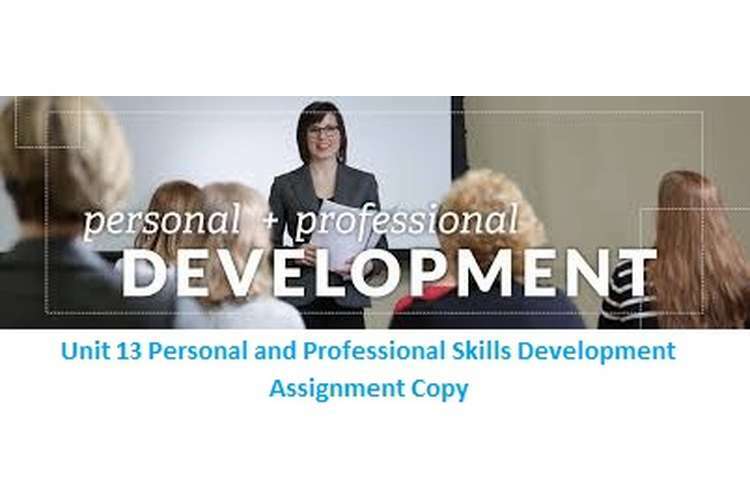 From the above Unit 13 Personal and Professional Skills Development Assignment Copy it is been considered that, personal and professional development is continues process that helps to gain the advantage over other people and gain the desired position. Report has explained the self-managed learning and life-long learning approaches and activities that could be used by me to maintain the effectiveness at Travelodge hotel. Moreover, report has presented the analysis of own skills and competencies against the organizational and manger level standard. At the end, report has developed the plan for improvement in the identified skills to gain the higher position. Aspin, D.N. and Chapman, J.D., 2012. Towards a philosophy of lifelong learning. In Second International Handbook of Lifelong Learning (pp. 3-35). Springer Netherlands. Bradbury, H., Frost, N., Kilminster, S. and Zukas, M. eds., 2012. Beyond reflective practice: New approaches to professional lifelong learning. Routledge. Bunderson, J.S. and Boumgarden, P., 2010. Structure and learning in self-managed teams: Why “bureaucratic” teams can be better learners.Organization Science, 21(3), pp.609-624. De Freitas, S., Rebolledo?Mendez, G., Liarokapis, F., Magoulas, G. and Poulovassilis, A., 2010. Learning as immersive experiences: Using the four?dimensional framework for designing and evaluating immersive learning experiences in a virtual world. British Journal of Educational Technology,41(1), pp.69-85. Desimone, L.M., 2011. A primer on effective professional development. Phi delta kappan, 92(6), pp.68-71. Graves, N. ed., 2013. Learner managed learning: practice, theory and policy. Routledge. Lago, C., 2010. On developing our empathic capacities to work inter?culturally and inter?ethnically: attempting a map for personal and professional development. Psychotherapy and politics international, 8(1), pp.73-85. McNair, L.D., Newswander, C., Boden, D. and Borrego, M., 2011. Student and faculty interdisciplinary identities in self-managed teams. Journal of Engineering Education, 100(2), p.374. McNiff, J., 2010. Action research for professional development: Concise advice for new action researchers. September books. Moon, J.A., 2013. Reflection in learning and professional development: Theory and practice. Routledge. Murdoch?Eaton, D. and Whittle, S. 2012. Generic skills in HRM education: developing the tools for successful lifelong learning. education, 46(1). Pp.120-128. Nicholls, G. 2014. Professional development in higher education: New dimensions and directions. Routledge. Pedler, M. 2011. Action learning in practice. Gower Publishing, Ltd..
Schein, E. H. 2010. Organizational culture and leadership (Vol. 2). John Wiley & Sons. The Unit 13 Personal and Professional Skills Development Assignment Copy will evaluate the approaches of self-managed learning that can be used for encouraging the learning of Travelodge hotel staff and propose the ways of lifelong learning in personal and professional context, Locus Assignment Help UK posting units solutions so scholars can explore Assignment Help in UK and get review the quality of our work.